Another leftover dish that was as good as the duck the first time around… Fried rice is a such an easy format for leftovers, but with a really flavorful duck, the rice is transformed into a flavorful all-in-one dish. You know the drill, take previously cooked and preferably cooled or cold rice and break it up from clumps. 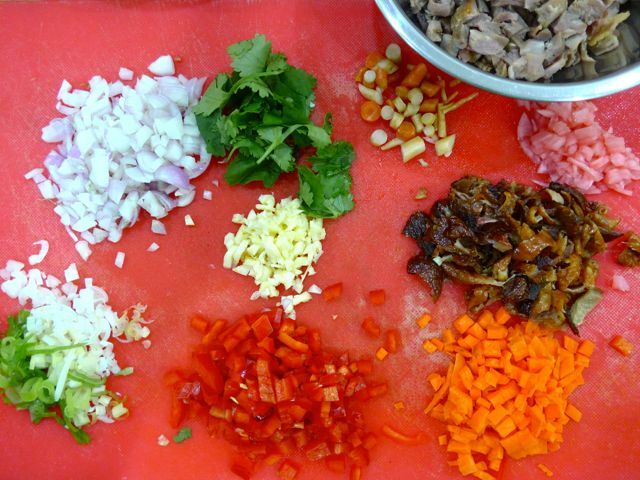 Chop up all the ingredients in the photo above (onions, garlic, spring onions, red bell pepper, carrots, pickled carrots and radish, dried chinese mushrooms reconstituted in warm water and shredded and chopped duck meat). 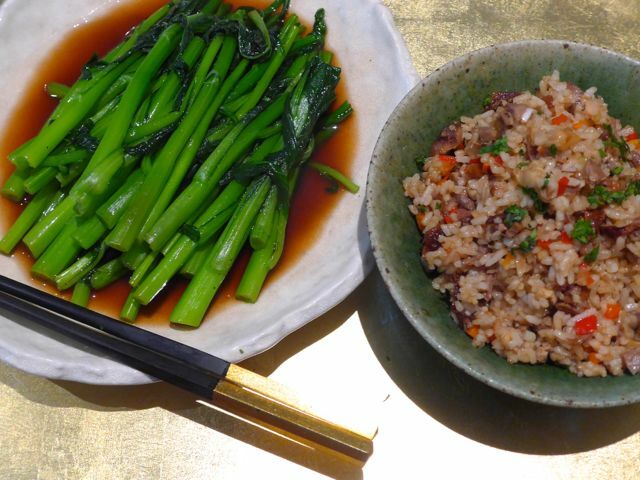 Heat up a wok or large frying pan and add some vegetable oil (peanut oil if you have it) and sauté the ingredients, add the rice and add some hoisin and soy sauce and mix until well combined. Garnish with chopped cilantro. Great! Was it brown rice or the brownish color was from soy sauce or from the duck/ mushroom water? I remember this TV show where a celebrity chef knocks on someone’s house unannounced, force opens the fridge (under duress, to the chagrin of the lady of the house, haha) and whips up a beautiful meal for the family from whatever’s in the fridge at that time (leftovers and all). Maybe MM should do the same when boredom strikes and he feels it’s time to do a good deed. My home would be most welcoming. I will stock up on preferred sinangag ingredients, put on my best pambahay tee and do my darn best to act surprised and smile at the camera. MM: Perhaps it’s time you included a chapter on left overs in your long awaited cookbook! Mushroom water! I learned something new again! It’s looks so appetizing. 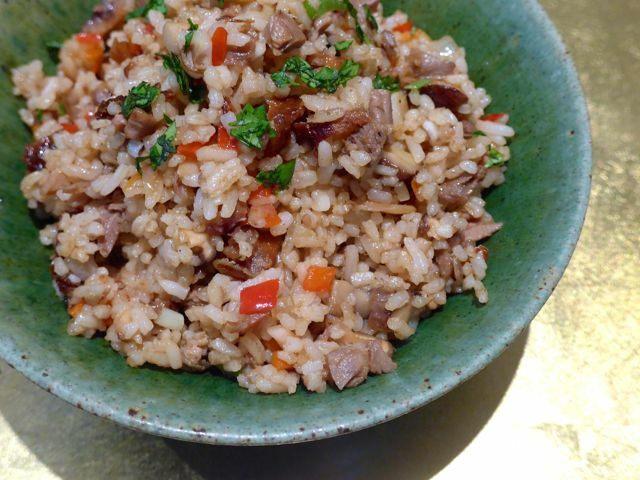 A creative way on cooking leftover roasted duck into fried rice. A versatile food that we can eat either breakfast, lunch or dinner. Flavorful and nutritious. I will definitely try this at home. My family will love it! Thank you, “Marketman” for the recipe.